Kefir taste and looks like yogurt. However, if compared yogurt to kefir is more nutritious. The process of making kefir is very easy. You just need to put it on a jar, leave at a room temperature and then wait for it to ferment. That’s it. 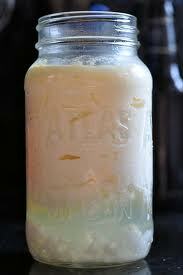 Take a look at the process enlisted below in making a homemade kefir. Place the kefir grains in the glass jar and then fill the jar with skim milk or whole milk until ¾ full. If available, you may use organic and non-pasteurized milk for better result. Cover the jar with two layers of cheesecloth and secure it with the use of a rubber band. Place the jar on the kitchen, away from the sunlight. Leave it there for two days while stirring it periodically using a non mental stirring rod or a plastic spoon. When a thick texture is achieved, filter out the kefir grains using a plastic strainer. Remember not to mash the grains. Place the grains in a separate jar. 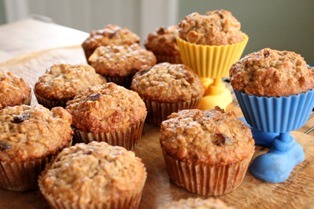 Add enough water to soak the grains and place it inside the refrigerator. You may use the grains again in your next kefir making. Meanwhile, you may serve the kefir right away after filtering or have it refrigerated first to keep it chilled before serving. The Kefir Grains We’re using and dealing with at the moment are Milk Kefir Grains from Russia. There’s also Water Kefir Grains. Those work extremely well in water, coconut water etc. I plan on introducing water Kefir Grains into my diet aside from the Milk Kefir Grains. Let me talk more details on that later. Kefir Milk is actually a cultured, enzyme-rich food filled up with friendly micro-organisms that will help balance your “inner ecosystem.” More nutritious and therapeutic than yogurt it supplies complete protein, essential minerals, and valuable B vitamins. Traditional Kefir is prepared at your home as this has been for several centuries by way of the ancients of the Caucasus Mountains in Russia. Fresh, non-pasteurized or pasteurized full-cream, low-fat or non-fat milk. Kefir may very well be consumed right away or store in the sealed bottle and refrigerate for just a 7 days and serve chilled. Another choice should be to ripen liquid Kefir at 70 degrees for a day or maybe more. It could possibly then be refrigerated for a longer time storage or served as you want. Ripening or secondary fermentation at 70 degrees improves flavor and increases nutrients and vitamins. Vitamins B6, B3 and B9 [folic acid] increases greatly during storage as a result of bio-synthesis of the vitamins mostly by yeasts of Kefir grain organisms. If you value plain Yogurt or ButterMilk or Sour Cream you might love Kefir. Most of my friends squirm whether they have a cup but they comprehend it into them given that they be aware of the making use of your Kefir Milk. Often the drink could be slightly effervescent for the way you earn it. I enjoy it that way likewise. You gain a taste because of it over time. For individuals who cannot cope with the taste and for some other reasons wouldn’t like to use milk, then Water Kefir Grains will another choice. I am posting about those shortly. Just remember, Drinking Kefir Milk created from Live Kefir Grains will give you a secret dose of probiotics. Superior to any commercially made Yogurt or pill. Exactly what are the Great things about Kefir? Nutrition – A single serving of kefir is a method to obtain protein, with 8 to 11 g per cup. Kefir now offers 10 percent with the recommended daily value for vit a and A quarter of the quality for vitamin D. Kefir is a way to obtain calcium, with 30 % of the daily value per cup, according to a 2,000 calorie diet. Probiotics – Kefir contains certain healthy bacteria which isn’t accessible in yogurt, including Lactobacillus Caucasus, Leuconostoc, Acetobacter species, Streptococcus species, Saccharomyces kefir and Torula kefir. These beneficial microorganisms assistance digestive health insurance and avoid the expansion of unwanted organisms in the intestines. Vitamins, such as vitamin K and B-12, are designed from the gut along with the probiotics in kefir facilitate this production. Aid in Lactose Intolerance – Even though it is produced with milk, the fermenting process used to create kefir causes it to become nearly lactose-free, note kefir manufacturers. In a study within the “Journal on the American Dietetic Association” published in May 2003, researchers from Pitt University tested 15 those that have lactose intolerance determined that kefir reduced symptoms just like gas, abdominal pain and diarrhea connected with eating lactose. The curds in kefir are small compared to individuals yogurt, making it easier to digest. Of course this study is promising, system severe lactose intolerance, you should check using your physician before adding kefir in your diet. Weight loss – A single serving of plain kefir contains 150 calories and eight g of fat, 5 g which often are saturated. Choose low-fat kefir should you be watching your weight, because 1 cup of low-fat kefir contains just 110 calories and also g of fat, with 1.5 g saturated. Researchers from Curtin University gold coast australia seen in an 2009 study that dieters who consumed five parts of dairy daily, together with a low-calorie diet, lost excess fat and abdominal fat than dieters who consumed just three servings daily. One cup of kefir counts like a serving of dairy. Possible Disease Prevention – Although more studies are needed, preliminary research has shown that kefir can have an effect on cancer cells. A study inside journal “Cancer Management and Research,” published in February 2011, saw that kefir effectively prohibited the rise of malignant T-cells, which play a role in some types of cellular cancer. Another study, published in “BioFactors” in December 2004, saw that compounds in kefir can help control high blood pressure and blood choleseterol levels in rats. More thorough studies within the outcomes of kefir on cancer and other chronic conditions are needed to draw any significant conclusions, however. Although kefir will be as old as ancient time, it has only recently did start to utilized. In the June edition of BMC Immunology Journal, researchers evaluated the issue of probiotic fermented milk on the offspring of nursing mice. They learned that the milk consumption either by way of the mother during nursing or through the offspring after weaning modified the roll-out of bifidobacteria population while in the large intestine in the mice. These modifications were having a loss of enterobacteria population. The administration of your milk towards mothers improved their own body’s defense mechanisms and this also affected their offspring. Offspring from mice that received the milk increased S-IgA in intestinal fluids which mainly came from their mother’s body’s deference mechanism. A decrease in the sheer numbers of macrophages, dendritic cells and IgA+ cells throughout the suckling period in offspring fed together with the fermented milk was observed. Researchers thought this could be linked to the development in the immunity of the mothers, which passively protected their babies. At day 45, the lymph nodes on the babies reached a maturity that reflected the consequences on the milk about the stimulation of these intestinal mucosal immunity. These studies means that kefir would be advantageous to both nursing mothers and babies. The Journal of Medicine and Food, June edition, reported an investigation to find out probiotic properties of kefir. Researchers used a carbohydrate fraction isolated from kefir to check for anti-inflammatory activity in the vitro plus in vivo using rats. Results indicated a significant decline in rat paw edema and overall trauma after treatments with kefir than the control rats. Conjugated linoleic acid (CLA) can be a naturally occurring essential fatty acid seen in kefir and other ruminant products that has been proven to possess anti-cancer activities in in-vivo animal models and vitro cell culture systems. The BMC Cancer Journal, July edition, reports a work to determine the results of CLA on apoptosis (programmed cell death) in human breast type tissue. Researchers found out that CLA induced apoptosis through estrogen receptor alpha while in the breast cells. These findings claim that the affect of estrogen on breast tissue is modulated by CLA. BenefitsofKefir.com – What is Kefir?